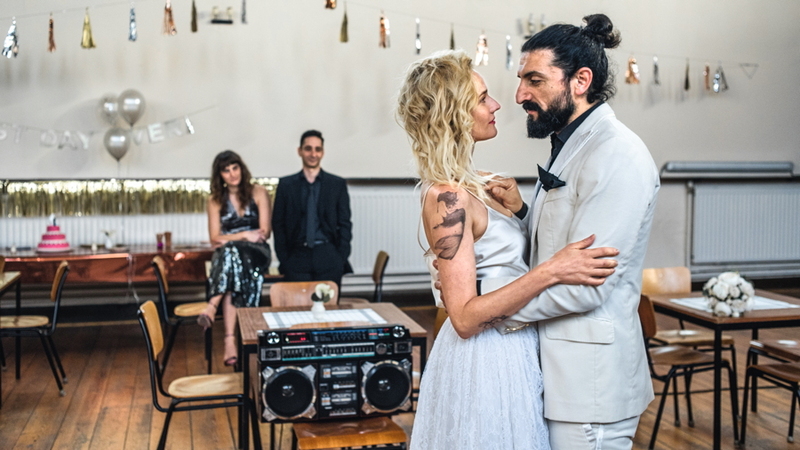 This film by German-Turkish director Fatih Akin features a ‘powerhouse performance’ by Diane Kruger which won her the best female acting prize at Cannes in 2017. However, when the film went on release in the US and UK (it opened in UK cinemas in June 2018) it failed to do the business that a Cannes prizewinner might expect. Unfortunately that isn’t so unusual. Sometimes Cannes juries make poor choices. On this occasion though, the problem is elsewhere. First, it’s an awful English language title. The original German title, which I would translate as ‘Out of Nothing’, is at least intriguing. Second, a brief plot outline suggests a conventional genre narrative and the film turns out to be something different. Diane Kruger plays Katja, the wife of Nuri (Numan Acar) a Turkish former drug dealer in Hamburg. She met him as a student buying dope and later married him when he came out of prison. He had been ‘clean’ and ‘straight’ for five years when he and the couple’s 5 year-old son are murdered. At this point Fatih Akin slows down the narrative and focuses on the shock and grief experienced by Katja. It is some time before the second part of the narrative (the film is split into three sections with title card headers) moves into the court case when the accused perpetrators appear in court. The third part goes on to address Katja’s reaction to the court’s verdict. I can understand why some genre fans will feel disappointed by the film, but the focus is on Katja and Kruger’s performance, not revenge action. The story is inspired by real events in Germany that had a big impact on Fatih Akin and he wants to explore what those events mean for various characters rather than simply offer a form of crime action picture. Diane Kruger is an attractive woman (she was originally a model, I think) and an accomplished actor. She represents the kind of European star familiar in the 1960s/70s but perhaps less so in contemporary cinema. She speaks French and English fluently and has appeared frequently in French and American cinema. Here she inhabits a character role. Dressed in jeans and leather jacket, with her hair straggly and her almost skeletal frame decorated with tattoos she is no glamour puss. It’s an intense performance which demands that we understand her grief and pain. She turns away her mother and her sister and the person she relies on most is her lawyer. I found the court scenes very interesting. I don’t think I’ve seen a modern German court in action and I was reminded of the courtroom in the Danish drama A War (2015) in a similar setting. The two films are actually quite different but the austerity/plain décor of the courtroom is quite different from the traditional UK court with its ‘majesty’ and trappings of the ruling class. However, in the one weakness in the film’s casting, I found the defence counsel to be too much of a type, portrayed almost as a stereotypical skinhead bully. Not surprisingly, Katja finds the trial very difficult to cope with. I won’t spoil any of the narrative but it’s interesting that the ways in which the panel of judges comes to a decision reminded very much of the Japanese court in Kore-eda Hirokazu’s recent The Third Murder (Japan 2017). As in all courtroom dramas, there is always the possibility that there will be a tension between what we as the audience know, or think we know, about the crime committed and the proper procedures of a court of law where the judges may not have all the knowledge we, the audience, has. Katja experiences trauma after the murder and it means that she ceases to menstruate. Towards the end of the narrative, after the courtroom drama she starts again. It appears to be a symbolic moment. Aus dem Nichts is the kind of film that divides audiences. On IMDb there are ‘User Ratings’ of ‘1’ and also of ’10’. I would recommend the film but I beg you not to set up genre expectations of what you think might happen or what you might want to happen. If you simply approach the film with an open mind, prepared to go where it takes you, that is likely to provide you with the best experience. It’s an 18 film in the UK – because of the situation I think, rathe than what is actually depicted.